The Open Door Classroom: Stock up on $1 and $2 Items... The Dollar Days Sale is Here! Stock up on $1 and $2 Items... The Dollar Days Sale is Here! As everyone is preparing for back-to-school, why not stock up on some great items for your classroom for either $1 or $2?! 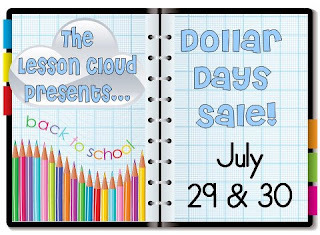 The Lesson Cloud's Dollar Days Sale starts tonight and lasts until Monday. Click the picture below to visit The Lesson Cloud and check out all the amazing products that are being discounted! Here are the five products that I am discounting for you! I hope you are able to get some goodies from this sale! Be sure to enter the Really Good Stuff $75 giveaway while you are visiting The Lesson Cloud's website! What a cool site! Thanks for sharing it! The text boxes on the covers of all these products.... how do you get them/make them?!? !